Please feel free to ask any questions and to post comments about the DIY 6DJ8 (ECC88) Tube Hi-Fi Headphone Amplifier Project in this forum thread. Congratulations Bruce! For sure it sounds amazing. All that is left at this point is a tube eq! However, my knowledge of electronic is almost none (if not sub-zero). Is it possible that you will provide BOM or PCB that will make my life so much easier? Hi, Pretty much all the parts are standard ones (they are listed on the schematic) and can be obtained from several sources. The three transformers all come from the same place (Edcor - on the web). There is no particular way to build the project. point to point or perf board will do fine. I just used a PCB I had from another project. Places like Parts Express, MCM, Allied, Mouser to name a few will be able to supply pretty much everything. There are no "premium" parts in the project. Thank you, Bruce. Your advice is appreciated. I visited another site, where the builder made " ECC88 OTL heaphone amp" using 3 of ECC88 tubes, and found it is very interesting, too. Do you think your design will drive HD600/650 better? I actually tried to find the diagram where 2 of ECC88 and one of ECC81 tubes are used, the diagram that can be found in Earmax SE. I used to own Earmax SE for a period of time, and impressed with the footprint. Any idea? Hi, Related to your question.... There are a couple of ways to connect the output of an amp to the speaker or in this case headphones. There are advantages and disadvantages to each. The three main ones are transformer, capacitor and direct. In a transformer coupled one the primary limitation is the quality of the transformer. The advantages are that it can more efficiently transfer power to the load (impedance matching). In capacitor coupled there are two main limitations, low efficiency and the limitations of the capacitor itself ( response, linearity mostly). In direct coupled the limitations are again low efficiency and also complexity of the circuitry, primarily in the power supply. I chose the transformer as I could get cheap wide band transformers that could be used push pull. Push pull has the advantage of cancellation of some harmonic distortion and inherent good sensitivity to rejecting power supply noise and hum. I wanted a very simple design that would be easy and cheap to duplicate. In capacitive coupled designs there is usually a need for multiple parallel tubes. Parallel tubes do not have the advantages of distortion and noise cancellation and thus make it necessary to have a cleaner power power supply (think more current and added cost and complexity). Additionally, they need to have large quality output capacitors. The capacitors are likely to cost more than the transformers I used. A design with direct coupling will often also require multiple tubes and frequently will be a push pull arrangement. It is probably the best sounding of the types if done well. Unfortunately it is the most difficult to get to behave correctly. There should be no DC at the output, very difficult to do without IC OP amps. It will need a split power supply as well (added complexity and cost). So now back to the basic question..... Since I have not built the one you mentioned I really can't say which would be better. Most phones only need about 1-10 milliwatts for full output so probably either will do. The one in the project delivers approximately 50-100 mw clean and if you choose higher cost and quality transformers will actually put out nearly 1/2 watt. The transformers specified in the project are really cheap and have good response. In general you could use any push pull transformer that has a primary from about 10K to 20K and secondary windings to match your phones. I considered some much larger ones, but decided that the intent of the project was a "low cost, simple amp" and they would not be suitable. Such a perfect answer to all of my questions, you addressed everything I have in mind. Thank you so much for your advice. 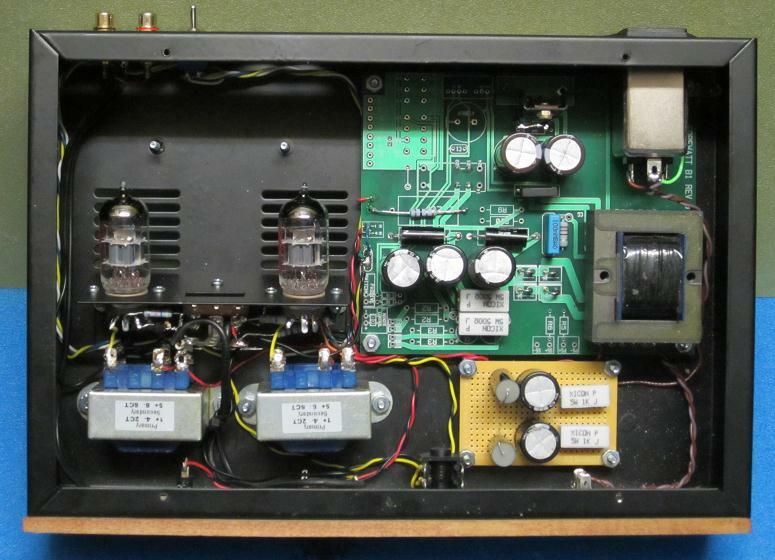 Has anyone in the UK tried building this amp with UK sourced transformers? I like the Edcor transformers but the shipping to the UK is higher than the cost of the transformers themselves! I really fancy building a valve based headphone amp but can't find the transformers in the UK. I like the Edcor transformers but the shipping to the UK is higher than the cost of the transformers themselves! Life's a beotch outside of the US for shipping. I live a LOT closer in Canada and doubling the website price for landed cost is pretty darn accurate.